Irish Setter origins are unknown, although the many setter breeds from the British Isles may share some of the same ancestors. Today’s Irish Setter came into being in the early 1800s and quickly became a favorite of both hunters and those looking for handsome companion dogs. The Irish Setter dog breed stands 25 to 27 inches tall and weighs 60 to 70 pounds. The body is slightly longer than tall at the shoulders. The head is long and lean, the eyes are almond-shaped, and the ears are dropped and folded. The tail reaches the hocks. The crowning glory of this breed is the rich red coat. The coat is short on the head and forelegs but is of medium length elsewhere. There is feathering on the ears, backs of the legs, belly, and tail. This breed requires regular grooming. The coat should be brushed daily to remove dirt and burrs and to prevent matting. The neck and feet are often trimmed, especially for show dogs, but many pet owners want the same clean look. The Irish Setter is an active dog who needs vigorous daily exercise. He can run alongside a bicycle, go for a jog, or take long, brisk walks. This breed can be funny and silly and enjoys playtimes. All exercise should be inside a fenced-in yard or on leash; the Irish Setter breed’s silliness can sometimes get him into trouble. All Irish Setter puppies should go through training that is firm yet affectionate and not forceful. Although Irish Setters are silly dogs, they are also very bright, so training is good for keeping their minds busy. Irish Setter puppies are slow to mature, so training should continue into adulthood. This breed also enjoys many dog sports, especially agility and flyball. The Irish Setter needs a fun-loving owner who doesn’t take life too seriously. He can be good with children, although puppies may be rowdy and rough. He is good with other dogs but should not be trusted with smaller pets. Health concerns include hip dysplasia, as well as thyroid and eye problems. Share your Irish Setter story. Note: Upload only Irish Setter picture or your picture with Irish Setter below - spammer's ip may be blocked. 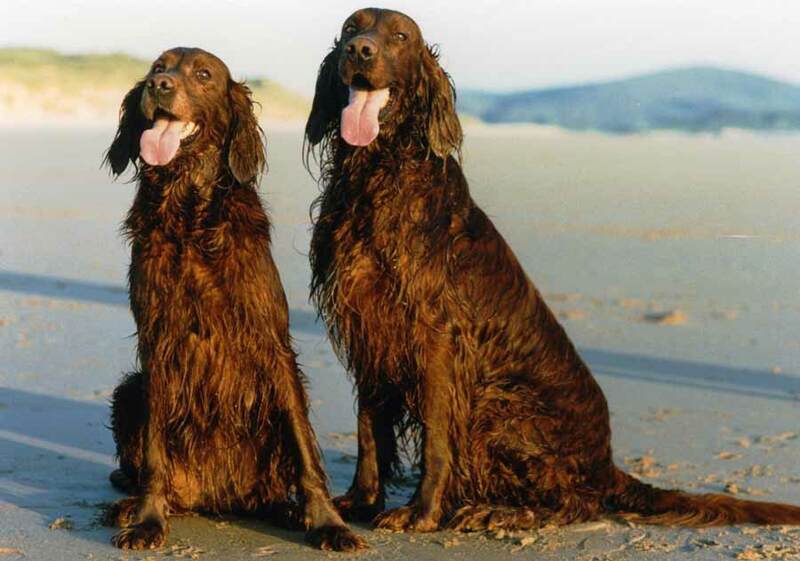 The picture above might surprise you if you thought Irish Setters came only in red! No, they also come in a handsome red-and-white pattern. The most popular of the three setter breeds (Irish, English, and Gordon), the elegant Irish Setter has been described as rollicking, happy-go-lucky, clownish, impulsive, flighty, and demonstrative. This lively dog can be a destructive handful during the gawky adolescent stage — which lasts two or three years. But given sufficient exercise and obedience training to instill good manners, adults gradually become more dignified and aristocratic. Though he has a willful streak and is easily distracted by exciting sights and smells (remember, this is a hunting dog! ), the Irish Setter is probably the most willing to please of the three setter breeds. You must be both patient and persistent when training setters, but never harsh, because these dogs are physically and emotionally sensitive. And they have long memories: once they learn something (whether right or wrong), they’ll remember it for a long time. This means bad habits can be difficult to break and harsh handling is not easily forgotten.